WINSTON-SALEM, N.C. – The Winston-Salem Open at Wake Forest University announced its player field for the tournament, which will be held August 18-24, 2013, at the Wake Forest Tennis Complex adjacent to BB&T Field. As of today, 39 of the 48 slots in the main draw have been filled, with the remainder of the entrants to come from wild cards and qualifying play. A number of prominent players and fan favorites have committed to compete in Winston-Salem, including James Blake, Gael Monfils and Tommy Robredo. Tournament officials announced last month that Triad native John Isner, winner of the 2011 and 2012 Winston-Salem Opens, will return for a third year to defend his title. Isner will be joined by previously announced competitors Tommy Haas and Sam Querrey. According to the ATP, the 39 players currently slated to compete at the Winston-Salem Open are all ranked in the top 75 in the world. Nine of the players competing in the Winston-Salem Open are ranked among the ATP top 30. There will be an additional field of 16 doubles teams to be named closer to the tournament. "Other than the US Open and the top-tier ATP Masters tournaments, the Winston-Salem Open offers greater playing field depth than probably any other men’s professional tournament in America this year. Nine of the players who will compete in the Winston-Salem Open have been ranked in the top 10 during their careers," said Tournament Director Bill Oakes. "The players’ attraction to Winston-Salem is due in large part to the incredible hospitality, fan support and volunteers that we offer." "For example, it’s wonderful for Gael Monfils to commit to our tournament this early. He committed because he has talked to other players who competed in Winston-Salem during the past two years and shared that this is a great place to prepare for the US Open," he added. "We’ve already received a number of calls from players interested in the wild-card slots, including two top players who have asked us to hold slots for them. By all measures, the Winston-Salem Open is going to be another outstanding tournament this year." 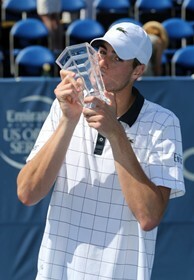 A graduate of Greensboro’s Page High School and four-time All American at the University of Georgia, John Isner is the two-time defending champion of the Winston-Salem Open and has never lost a match at the Wake Forest Tennis Center. The 28-year-old local favorite beat Tomas Berdych in the final last year, after winning the inaugural Winston-Salem Open in 2011 by beating Julien Benneteau in the final. The 6-foot-9 Isner boasts perhaps the most powerful serve on the ATP World Tour and has led the tour in aces two of the past three years. He reached a career-high No. 9 in April of 2012 and is currently ranked No. 19, no thanks to a knee injury in January that forced him to miss the Australian Open and the following four weeks. He won the sixth ATP title of his career in April when he won at Houston and advanced to the third round at the French Open. Tommy Haas has been arguably the most compelling success story on the ATP World Tour this year. At age 35, he has climbed all the way to No. 11 in the rankings. He recently reached the fourth round at Wimbledon after advancing to the quarterfinals of the French Open a few weeks earlier. Haas won the 14th ATP title of his career in Munich in April and also has reached the final at San Jose and the semifinals at Miami this year. Once ranked as high as No. 2 in 2002, Haas has battled through five major surgeries and has twice won the ATP World Tour’s "Comeback Player of the Year" award, including last year. His best year came in 2001, when he won four titles. Gael Monfils is currently ranked No. 60 but has been as high as No. 7 in the world in April 2011. The 26-year-old Frenchman is widely considered to be one of the most entertaining players on the ATP World Tour. He has been hit with injuries the last two years and was recently forced to miss Wimbledon, but he upset Tomas Berdych and reached the third round at Roland Garros in May. He also has reached the final at Nice and won a Challenger event in Bordeaux this year. Monfils will be making his Winston-Salem Open debut. He requested a wild card last year but was forced to withdraw at the last minute as he continued to rehab from a knee injury. James Blake is one of the most-popular players ever to come to Winston-Salem, having played for the United States in Davis Cup ties at Joel Coliseum against India in 2001, Spain in 2007 and France in 2008 and then returning for each of the first two Winston-Salem Opens. The 33-year-old, currently ranked No. 85, has 10 ATP singles titles, including five in 2006, when he reached a career-best No. 4 in the world. He teamed with Jack Sock to win the doubles crown at Delray Beach earlier this year. The 6-foot-6 Sam Querrey is currently ranked No. 21 in the rankings. He has seven career ATP titles, including three in Los Angeles. Querrey captured four titles in 2010 and won the US Open Series in 2009. He missed the inaugural Winston-Salem Open in 2011 while on the mend from elbow surgery but had an impressive showing last year, reaching the semifinals before losing to Tomas Berdych. Querrey’s best finishes this year have been trips to the semifinals in Auckland and San Jose. Juan Monaco, currently ranked No. 20, reached a career-high No. 10 last July and won four tournaments in 2012. The 29-year-old Argentine owns eight career ATP singles titles, the most recent coming at Dusseldorf in May. He will be returning to the Winston-Salem Open after a one-year absence; he reached the quarterfinals of the inaugural 2011 Winston-Salem Open before losing to Andy Roddick. Alexandr Dolgopolov, currently ranked No. 24, has played in both previous Winston-Salem Opens and reached the quarterfinals both times. The 24-year-old Ukranian lost in the quarters to Sam Querrey last year and to Robin Haase in the quarters in 2011. Dolgopolov has two career ATP singles crowns, including Washington last year. He recently advanced to the third round at Wimbledon. Similar to Tommy Haas, Tommy Robredo, currently ranked No. 28, is another incredible comeback story at age 31. He claimed the 11th ATP singles title of his career by winning at Casablanca earlier this year and recently has reached the quarterfinals at Roland Garros and the third round at Wimbledon. Robredo was ranked as high as No. 5 in 2006. He competed in last year’s Winston-Salem Open and played two singles matches at Joel Coliseum in the U.S. vs. Spain Davis Cup quarterfinal in 2007. He lost to James Blake and then beat Bob Bryan in a dead rubber that weekend. Andreas Seppi, currently ranked No. 23, is playing some of the best tennis of his career at age 29. The flashy Italian reached a career-high ranking of No. 18 in January, after an outstanding 2012, in which he won tournaments in Moscow and Belgrade and also reached two other finals. He owns three career ATP World Tour singles titles. Seppi recently reached the fourth round at Wimbledon and the semifinals at Eastbourne. He also reached the fourth round at the Australian Open this year. Benoit Paire, currently ranked No. 27, continues to climb up the ATP rankings, having reached a career-best No. 25 earlier this month. The 24-year-old Frenchman has a distinct look, at 6-foot-5, 176 pounds, and a distinct playing style, as well. He’s still looking for his first ATP singles title but was a runner-up to Richard Gasquet in Montpelier earlier this year and recently won a Challenger event in LeGosier, Guadaloupe. He also beat Juan Martin del Potro in Rome earlier this year in reaching the semifinals before losing to Roger Federer. The Winston-Salem Open, an ATP World Tour 250 event with a total purse of $625,000, will take place from August 18-24, 2013, with qualifying set for August 17. The tournament will be the final men’s event of the Emirates Airline US Open Series. For more information on the 2013 Winston-Salem Open, please go to winstonsalemopen.com. Now in its tenth season, the Emirates Airline US Open Series continues to serve as a true regular season of hard-court tennis, linking nine summer tournaments to the US Open. Fans follow the action throughout the summer during national broadcast coverage, while players battle for $40 million, including a chance for bonus prize money at the US Open. The Series collectively reached a U.S. television audience of 39 million and drew more than 800,000 on-site fans in 2011. In 2012, Emirates Airline became the title sponsor of the Series, as well as the official airline of the US Open. The Emirates Airline US Open Series is also supported by sponsors American Express, Chase, Citizen Watch Company and Esurance.